These classy looking autumn inspired napkin rings will add the perfect touch to any Thanksgiving feast. As an added bonus they are very easy to make from salt dough clay and cost next to nothing. Golden yellow paint or some other autumn color. Ribbon in a dark autumn color such as maroon. 1. First you will need to make the salt dough. 2. In a medium bowl mix: 1 Cup salt, 1 cup flour and ½ cup water. 3. Knead the dough until it reaches a clay-like consistency. If it is too sticky add more flour. If it is too dry add more water. 4. Put a small amount of flour on the area where you will be rolling out the dough and spread it evenly so that the dough will not stick. 5. Roll out the dough with the rolling pin until it is about a ¼ of an inch thick. 6. Use the button or stamp to make an impression in the dough. 7. Use the knife to cut a rectangle or square around the impression. 8. Place the pieces on the cookie sheet. Make sure you place them on the sheet with the indent facing up. 9. When you have made as many as you need. Turn the oven to warm and put the pan in the oven. 10. The amount of time it will take to dry the pieces depends on the oven. So check them constantly. It will most likely take about 2-3 hours for them to dry completely. When they are done they will be hard, light and make a hollow sound when tapped on. 11. When they are done, paint the indent with your chosen color. 12. Allow the paint to dry. 13. Plug in the hot glue gun. 14. Cut the ribbon into four inch long pieces. 15. 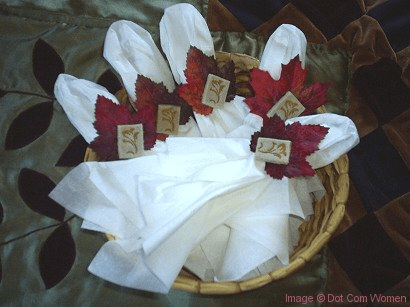 Choose leaves for the napkin rings and remove stems if necessary. 16. With the hot glue gun, put glue on the back of a salt dough piece and attach it to the front of a leaf, so that the piece is slightly slanted. 17. When the glue has dried turn the leaf over and put a small line of glue towards the base of the leaf. 18. Attach the ribbon so that it forms a ring. 19. Use as you would any other napkin ring.